In The Play’s The Thing, it’s time for the 500th anniversary of the Stonebridge Faire – an event with a long history of mayhem and a legendary “curse.” As part of the festivities, the Elsinore Players come to perform their new Shakespearean thriller. But “accidents” of a suspicious nature begin to happen. Is it a saboteur, or is something more sinister taking place? Something strange is happening at the Woodburton Army Base. Two identical murders occur in only a couple of days, and the suspects swear that a ghost committed them. 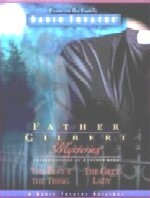 Father Gilbert is brought in to investigate the mystery of The Grey Lady, bringing him face-to-face with a dangerous conspiracy. The third edition of Father Gilbert Mysteries delivers spine-tingling intrigue and a plot twist in every scene. Recorded in London, this audio drama features an award-winning cast and film-quality sound design to create a world that will inspire your imagination. As the vicar of an ancient church in a small English village, Father Gilbert finds himself at the center of one strange mystery after another. And he brings to each one his unique combination of street-wise smarts and spiritual intuition.